Josh is set to make a big return with his bandmate Tyler Joseph when Twenty One Pilots release their fifth studio album TRENCH later this year. Here's everything you need to know about Joshua William Dun. 1. What is Josh Dun's birthday? Josh's birthday is 18 June 1988, making him 30-years-old. His star sign is Gemini. 4. Josh has a line of drumsticks. Josh has his own line of drumsticks with Zildjian. They come in Blurryface red and were inspired by Twenty One Pilots’ Skeleton Clique “Alien Josh” logo. 5. Josh Dun is engaged Debby Ryan. Josh is known to be a private person who doesn't speak about his personal life however it's common knowledge that he's dating actress Debby Ryan. They began dating back in 2013/14 (when this photo was taken). On 23rd December 2018, Josh and Debby got engaged in New Zealand, with the couple sharing photos of Josh getting down on one knee on their Instagram accounts. 6. Josh has a dog called Jim Dun. Fans first found out about Jim via an Instagram post by Josh's brother, Jordan (that's him in the photo). Jim is yet to make an appearance on Josh's Instagram but has appeared several times on Jordan's, which makes us think Jim might have been adopted by Jordan. Either way, he's exceptionally cute. 7. Josh has three siblings. Josh has two sisters, Ashley (pictured) & Abigail, and a brother, Jordan. 8. What is Josh Dun's net worth? Net worths are usually inaccurate and numbers tend to be plucked out of thin air, so take any figures you find with a pinch of salt, but several sites are claiming Josh's net worth is $10 million. 10. Is Josh on any other social media? 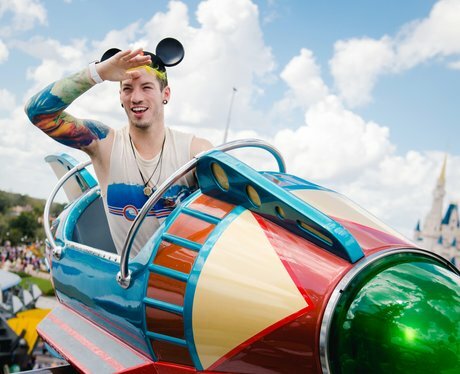 Yep, you can find him on Instagram and Twitter (joshuadun). 11. What is Josh Dun's ethnicity? A lot of people have been searching online for Josh's ethnicity, in particular asking if he has any Japanese or Korean heritage. Well, back in 2012, Josh Dun posted a picture of a black and white photo of a man with the caption: "Leaving for Japan in the morning. This is my great great great grandfather Edwin Dun. Ambassador to Japan. Him and his Japanese wife are responsible for any Asian looks I have." So there you are!